A customer “complained” to me the other day that keyboard input on their computer was slow and delayed. I tested Microsoft Word and some other programs and everything worked normally. I troubleshot their computer some more and found that keyboard input was only slow and delayed in Google Chrome. Once I discovered keyboard input was slow in Google Chrome, I doubled down on the issue. Before I get into what all I did to troubleshoot the issues, this computer was running Windows 10 and Google Chrome Version 50. I tried these troubleshooting steps and none of the below worked. I searched high and low on the Internet for an answer to this issue. However, I could find nothing that worked. After all the above troubleshooting, I was convinced it was a process in Windows that was creating issues. I started by killing one process at a time and then typing in Google Chrome. After killing the iDrive process, for iDrive online backup, I tried typing in Google Chrome – everything was fine. I started iDrive backup again and once again my typing in Chrome was delayed. I updated the iDrive application to the latest version and it seemed to have fixed the issue. If this issue returns again, I may need to uninstall iDrive and install a different online backup program. I really can’t explain why this fixed the issue. I know the fix above may not solve your slowness issues in Chrome. If there is one person out there that this article can help, it will be worth this blog post. I will post some links below to some other articles that have Google Chrome troubleshooting tips that may help you. Please let a comment below if this post helped you, thanks. This was posted by techspeeder. This entry was posted in Troubleshooting and tagged Chrome Version 50, Google Chrome, iDrive Backup, Windows 10 on May 21, 2016 by Merlin Halteman. I ran into a very frustrating issue today. My job was to join a brand new Windows 10 computer to a domain. The server was running Windows Server Essentials 2012 R2. I felt this would be a simple job- but it didn’t turn out that way. 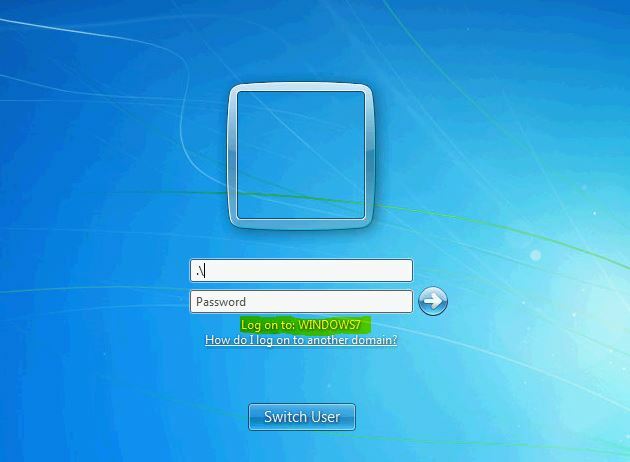 Typically, I join the computer to the domain using the Windows Server Essentials connector tool. Here are the steps I use below. Step One: I went //servername/connect and installed the connector software. I rebooted the computer when I was prompted to do so. Step Two: The computer rebooted and started booting into a _clientsetup_$ profile. The computer took a minute or two but it logged into the _clientsetup_$ profile. I was then prompted to enter the user’s credential’s to connect the computer to the domain. Step Three: I entered the credentials, and then I selected “Setup this PC for myself”. Instantly, the connector software froze and said: “Windows Server Essentials Connector” has stopped responding, end program. The Connector software closed but the computer kept me logged into the _clientsetup_$ profile until I rebooted the computer. I then logged into the computer. The computer was joined to the domain but the Connector software was not installed. I thought this may have been a one-off issue so I tried joining the computer again. Once again, I was greeted with “Windows Server Essentials Connector” has stopped responding. I will list below all the things I tried -none of them worked. I tried to join the computer to the domain with the admin credentials instead of the user’s credentials. During the Connector software setup, I selected “Setup this PC for myself and others” instead of “Setup this PC for myself. I checked Event Viewer. It said clientdeploy.exe has stopped working. Right before that error, I got a .Net framework error as well. I ran the Microsoft .Net Repair Tool. The .Net repair tool didn’t fix my problem, so I turned off .Net framework in “Turn Windows Features On or Off” in Windows. That didn’t work as well. Installed the Windows Server Essentials R2 Connector from Microsoft’s website. Connected the laptop via an Ethernet connection (instead of wireless) and ran the wizard. I joined the domain manually and then tried to run the Connector software. It still failed. I created a new local admin profile and ran the Connector wizard from that profile. I checked the server. The computer showed up under the devices tab in the dashboard as being on the domain. However, the computer showed offline and the server didn’t know what OS was installed or anything about the client. This entry was posted in Main Menu, Troubleshooting and tagged Server Essentials 2012 R2, Server Essentials Connector, Windows 10, Windows 10 Upgrade, Windows Server Essentials R2 on April 19, 2016 by Merlin Halteman. This is the latest bug I found with Windows 10 Version 1511. In Windows 10 offline files are not indexed or searchable in the Windows 10 start menu. Let me explain how a lot of small companies are setup and how this impacts us. Most small networks have some version of SBS or Server 2012. A lot of IT admins, including us, using the folder redirection group policy to redirect the users’ documents to the server. This essentially gives the workstation a “backup” for its documents and also allows a user to access their documents on multiple devices. On each device we set the redirection folders to also be offline files. This allows the user to go outside the network and still have their redirected documents with them. This works absolutely beautiful with Windows 7 – you would think it would work great Windows 10 as well, but NO it doesn’t. I verified this has happened on multiple computers and different customers. When you set the documents to be offline files and redirected, Windows will “index” the offline files – but it really doesn’t. A quick search in the start menu will come back absolutely empty. You can search all you want with the new “Better” start menu and it will not return even one redirected , offline file. 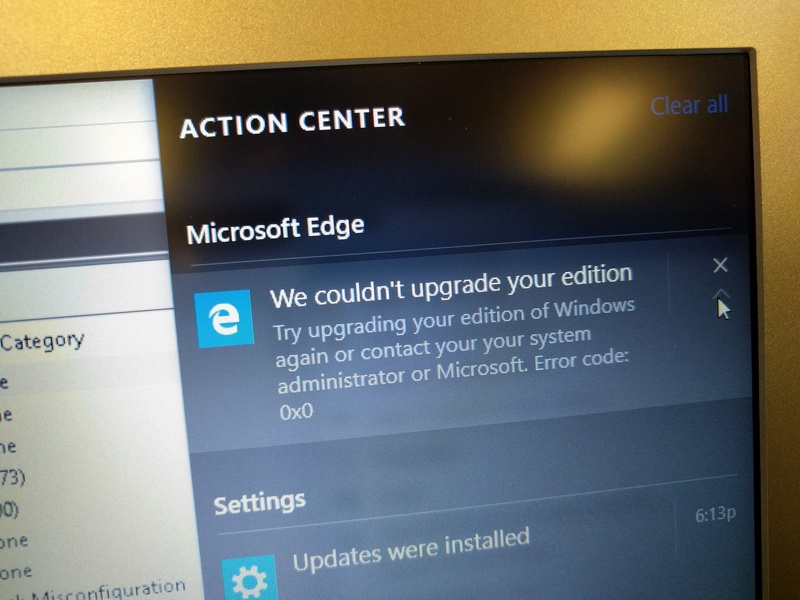 Good Job, Microsoft! I knew we couldn’t be the only company that uses redirected folders and offline files, so I did some checking on Google. Sure enough I found this forum thread with other users that have the exact same problem. I would like to hear from you if you are experiencing the same problem. If you are experiencing the same problem, please post of this forum thread and comment below if you have found any fixes or work around. In the meantime, I will keep a close eye out for any fixes that come along. As far as for the users that already upgraded to Windows 10, sorry no searching Windows 10 offline files for you – yet! This was posted by techspeeder. Please follow me on Twitter and subscribe to my YouTube Channel. This entry was posted in Troubleshooting and tagged Offline Files, Redirected Folders, Start Menu, Windows 10, Windows 10 Bug, Windows Search on March 16, 2016 by Merlin Halteman. As you can see, that error code doesn’t give you much information. After multiple attempts, I decided this wasn’t a fluke issue and decided that there much be some software issue. Here is how I resolved this issue. I’m not sure which troubleshooting step actually solved the issue but the upgrade went smoothly after I did the following. Step One: I uninstalled McAfee Antivirus software. I have never liked McAfee so I decided I would start there. This entry was posted in Troubleshooting and tagged Windows 10, Windows 10 Home, Windows 10 Pro, Windows 10 Upgrade on February 9, 2016 by Merlin Halteman.